Ok I know you are probably sick of these posts, but I found the energy to remake my November block so I thought it deserved it's own post. When I have a zillion things going on it is SO HARD to find the will to do something that I have already done once. And here are the finished blocks. They are only 6.5" square and I will be making them into a wall quilt (hopefully) soon to hang in our guest room. I am still pretty unsure about layout for these, but I have a few ideas so hopefully I can narrow it down before the new year. 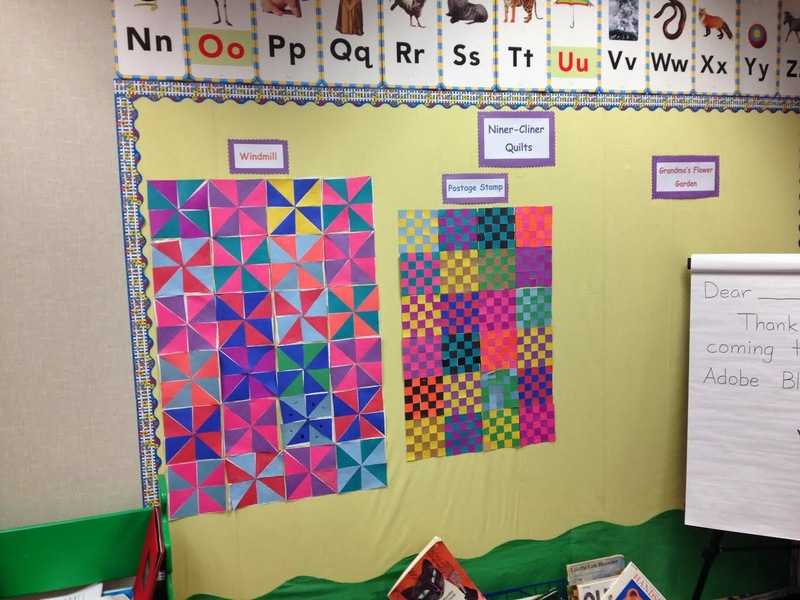 In addition to having Old Fashioned Day, my daughter's kindergarten class has been learning about quilts. Amazing! Apparently my daughter mentioned to her teacher that I am a quilter and she asked me to come in last week to talk about quilts. It was amazing and the kids were so interested and had so many fun questions. This is a wall with some of the "quilt blocks" they have made. How NEAT that you went to school to talk about quilts. Wow, and that after old fashioned day. Your school has it going on! That must have been a wonderful experience. Congratulations!You've probably encouraged several new quilters. Last year for Seuss Day, I made my daughter's kindergarten teacher a Seuss quilt. The class sent me the loveliest thank-you card--a giant Cat Hat. I'm not usually sentimental, but I kept that card. I like your new block way better than the first one...better contrast, better colors. How is Harper's Kindergarten class? Your quilting lesson was wonderful. Did you show them some finished ones? Your new block looks great! 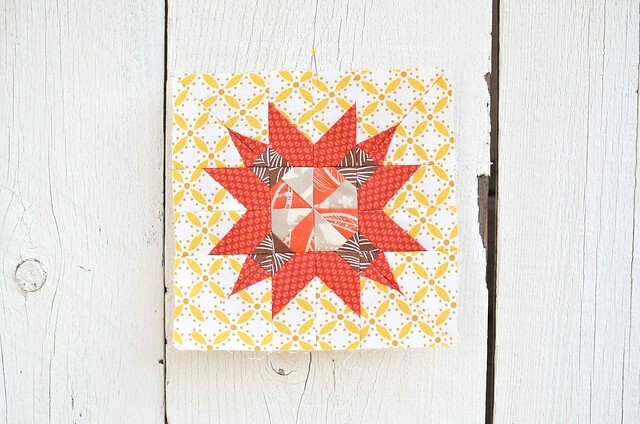 How fun for the kids to make quilt blocks! Are they going to be turned into a quilt? Your Lucky Stars are my absolute favorite ones!! They look so terrific together! Your daughter's K class sounds amazing. There are a few good story books about quilts too. Quilting makes some wonderful math connections for the littles. No, I am not tired of seeing your BOM stars. You inspired me to do them also, however I did not start until September and only have four blocks completed. 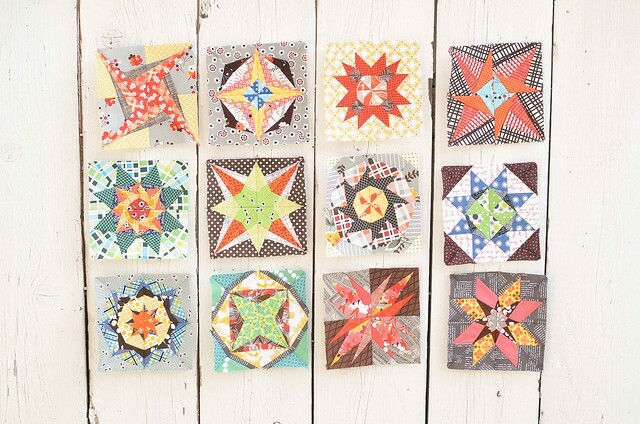 Your fabric choices have helped me step out of the box and give my own blocks more pizazz. I look forward to seeing your finished wall hanging. How cool that your daughter's class is learning about quilts. Maybe you will inspire the next next generation of quilters! This star is gorgeous, but they all are-I really like the fact they're only 6.5" blocks---so small and lovely. You're inspiring me to make a wall hanging. ;) So glad I found your blog, following you for more quilty lovelies. Cheers!